Spring Cash Giveaway! Open Worldwide! Over here at MommyMatter, we have finally developed a big Canadian following and it is something we are very proud to have! Since we love our follow Canadians, we thought it was time we brought you guys another giveaway open to our Canadian friends. We’ve teamed up with some great friends of ours, also Canadian, to bring you this wonderful giveaway. Some of the friends we have involved in this giveaway are This Lil Piglet and Tales of a Ranting Ginger, two ladies we’ve read since we knew they existed! So let’s learn a little about this fabulous giveaway! 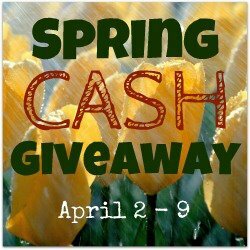 Spring Cash Giveaway – Value of $108 PayPal Cash! Whether you are Canadian or not, this giveaway is open to you. Enter for the chance to win a wonderful prize from some lovely Canadians easily. All you have to do is complete the Rafflecopter form listed below… no joke. It is that simple! Now who could resist having the chance to win money… that you can spend on anything you want… I know I’d enter if I wasn’t hosting this! This giveaway begins on April 2nd at 12:01am EST and will run until April 9th at 11:59pm EST. Yes, this means you have a total of 7 days to complete all the entries, and the benefit of Rafflecopter is, if your kids are sitting here driving you mad, take a break and come back after! So what you waiting for… GO ENTER NOW!